If you require a roof coating that can withstand harsh weather conditions and other environmental challenges, Metacrylics silicone products offer a solution that stands second to none. They are formulated with high-volume solids (98%) and provide the balance of performance and affordability you would come to expect from a veteran of more than 40 years in the industry. High-volume solids: The contents of our silicone top coats vs others carry significantly increased waterproofing and reflectivity when compared to other silicone top coats, making them ideal for locations that endure heavy precipitation and extreme temperature swings. The composition also offers enhanced overall durability and leak resistance. Low VOC fluid coating: Many manufacturers still use these dangerous materials at high levels in their products. To comply with California’s stringent environmental regulations and foster a healthier ecosystem, we have significantly cut down on our use of volatile organic compounds (VOCs) without sacrificing the quality of our product in any way. Time and labor savings: The silicone coating’s chemical makeup also reduces the complexity of installation. The high-volume solids form a much thicker coat upon initial application, which reduces the need for multiple passes and reinforcements to guarantee similar levels of protection. By eliminating those extra steps, you’re gaining a quality product in a quick, efficient manner. Easy application: While the silicone’s natural properties already reduce the need for added labor and time, Metacrylics aims to make the process even easier by offering multiple methods for application. Select between sprays, brushes and rollers to suit a wide range of roof surfaces. Better adhesion: You’ll never need to worry about your coating tearing up or breaking down prematurely. Silicone carries better adhesion capabilities than other options, and it can stick to other pre-existing coats when you have the surface appropriately prepared. You’ll find that silicone roof coating can fit on multiple roofing surfaces with relative ease. It’s an excellent choice for roofs that suffer from leaks or sagging but still maintain good structural integrity. 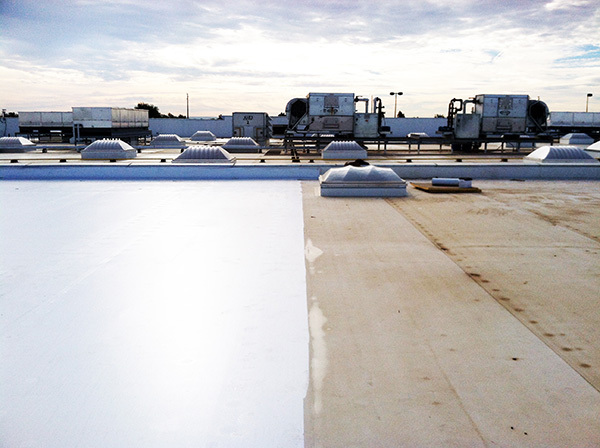 Common roof types that match up well with Metacrylics silicone coatings can be applied to smooth BUR/modified cap sheet, concrete, metal and other single-ply roofing membranes. As one of the biggest manufacturers in the industry, we’ve provided our services to many different clients and projects. We can work with universities, residential properties, government buildings, airport terminals and others. Metacrylics utilizes a Total Service approach, which we’ve implemented for a long time with proven results and repeated acclaim. We stake our claim as more than silicone roof coating manufacturers, as we also believe in giving our customers a unique experience tailored to their needs and requests. Our trained, knowledgeable staff offer total technical service support from start to finish. You’ll also benefit from comprehensive, renewable warranties. Contact us today to get started on your project. Copyright © 2019 Metacrylics®. All Rights Reserved.